We have been supporting people with Autism, ADHD, Dyslexia, learning difficulties and learning disabilities to gain meaningful training and employment for over 20 years. Our team are experienced at supporting people with a range of needs and we will work with you on a one-to-one basis to create a personal development plan that you feel is achievable. We will help you identify jobs you may be interested in, provide work tasters and placements and support you with job applications and interviews. Our dedicated Careers Guidance Officer, Job Coaches and Employment Officers will be there every step of the way to ensure you gain the training and support you need to get a job and stay in that job. With connections to employers across a variety of industries, we support people to get paid jobs in retail, catering, hospitality, administration and other sectors. We are confident that we can support you to gain training and employment that will change your life. We offer a range of accredited and non-accredited training courses to help you develop new skills and knowledge. When you sign up to our Training + Employment Service you will be assigned a dedicated Job Coach. Your Job Coach will work with you to identify your employment goals and look at the skills and qualifications needed to apply for jobs you are interested in. We will support you at your own pace to find employment and continue with support so that you stay in employment. With connections to hundreds of employers, we support people who experience barriers to employment into paid jobs in retail, catering, hospitality, administration and other sectors. Our goal is to help you find a paid job that you enjoy and to support you to stay in that job. Getting off to the right start with an employer is crucial and we know that it is important that your employer gains a good understanding of your needs. Your dedicated Employment Officer will accompany you to meet with your employer to discuss settling in, probation periods and reviews. If you have any issues, we can help you discuss them with your employer. We will check in with you and your employer regularly to ensure that you are happy in your new role. Our door is always open if you need us. “I have struggled to find work for a long time. It was difficult to get an interview and I did not have the confidence to really sell myself to an employer. I wanted to find work so that I could be more independent and feel a sense of achievement. I then found out about the support available from Stepping Stones NI’s Gatelodge Training and Employment Service in Newtownards and it has changed my life. I have completed OCN level training in Health and Safety, Money Management and Customer Service. I have learned so much and developed the skills and confidence to go on to get a job that I enjoy “. We see everyone’s potential and will support you to overcome barriers and gain new skills. Our team are experienced at supporting people with a range of needs and we will work with you on a one-to-one basis to create a personal development plan that will help you gain new skills. Developing the skills to get a job and stay in that job are crucial to your future success. Our team are here to support you to a brighter future. Our Job Coaches and Careers Guidance Officer will support you identify jobs you are interested in doing. Knowing what you want to do can be difficult and so for many of our clients a work placement or work taster is the perfect way to try out a job to see if it suits. 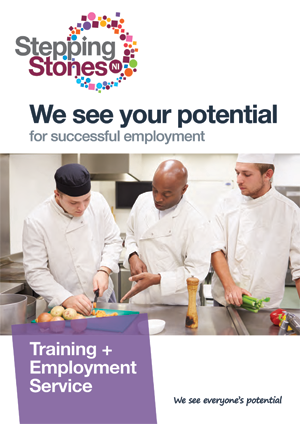 We have connections with lots of employers who are keen to offer work placements and tasters to Stepping Stones NI clients. Your Employment Officer will organise this for you and make arrangements with the employer to help you settle in. We will check in with you to discuss how you are progressing and meet with you employer to gain feedback. In many cases, our clients perform so well in their placements that they are offered paid work! The most important thing about work placements and tasters is that you gain an insight into a particular role and develop new skills. If you find that what you have learned from a work placement or taster isn’t for you, you will be supported to move on. Our goal is to support you into a role that leads to a better future for you. “I was unsure of what I wanted to do but the support and encouragement from Stepping Stones NI has really helped me to know what I wanted to do. Work placements are a really good way of trying out different jobs. I have really enjoyed my placements and I know that I want to get a paid job in catering as I am enjoying my current placement so much at the Christ Church Café. The support I have received from my Employment Officer has been great and I would recommend Stepping Stones NI to anyone”. "Hi I’m Matthew, I’m 21 years old and from Lisburn. I always dreamed of working in a professional kitchen from a young age. 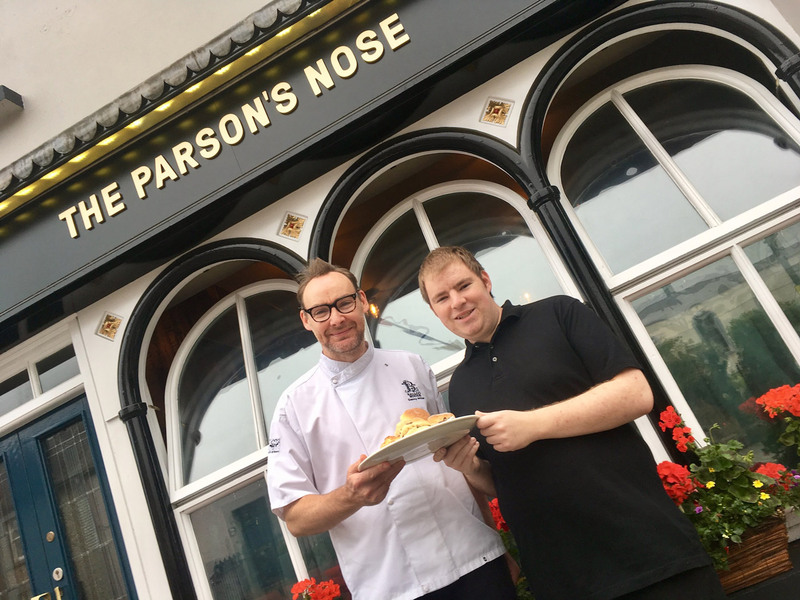 I’m proud to say that I secured a full time job working alongside top chef Danny Millar at The Parson’s Nose in Hillsborough. Stepping Stones NI have helped me to make this happen. I accessed training and developed confidence in myself to secure this role. My Employment Officer supported me to create a CV that made my skills and qualifications stand out. I was also supported to prepare for interview. I’ve always loved to cook and after school I went on to complete NVQ’s in Professional Cookery but struggled to secure a job I loved. I have moderate learning difficulties but was always determined to succeed.